Master in Corporate Law & Finance. Postgraduate Program in Corporate Finance of the Postgraduate School of the University of Lima. ESTUDIO DE BRACAMONTE HAAKER CASTELLARES ABOGADOS, Partner. 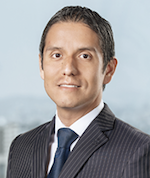 BANCO INTERNACIONAL DEL PERU S.A.A., Senior Legal Advisor. LA FIDUCIARIA S.A., Senior Legal Advisor.